Gingerbread is one of those treats I never really cared for until a few years ago. It always had way too strong of a taste for me, and to be honest I thought it was kind of boring. After I realized that the type of molasses you use in baked goods can drastically alter the flavor, I decided I wanted to give gingerbread another chance, and fiddle around with a new recipe. I’m glad I did because this is a wonderful little cake that is now a staple in my fall and winter baking. I use a very mild molasses which I prefer, and all the spices going on equal not boring at all! When you first taste it you get that sweetness that gets cut just enough with a bite from the molasses adding a little sassiness. This gingerbread is lovely on its own, but I always tend to add a schmear of mascarpone to it. I also find that it tastes even better the second day, and it freezes very well. I know that this is a bit of a low key recipe for me, but I think in order to make the fancy stuff, you have to have a good foundation. This recipe is also part of a new dessert that I have coming up next, and I can’t wait to share it! I love when I can make part of a dessert ahead of time, so when you make this freeze half of it. I promise you’re going to like what happens next… Enjoy the video! Spray an 8″x 8″ pan with nonstick cooking spray. Line with parchment paper for easy removal. Add egg & mix until combined. Combine vinegar and milk and set aside (mixture will curdle). Alternate adding dries with milk mixture, starting & ending with dries. Pour batter into prepared pan and spread out evenly. Bake for 50-60 minutes till gingerbread is set and pulling away from sides of the pan. >Your gingerbread looks like the perfect way to start off the holidays! >That looks so perfectly moist! I've never had gingerbread, only gingerbread cookies with a very different texture, and our German pfefferkuchen, which a aren't quite the same, looking at recipes and pictures. I'm curious though, this looks wonderful! >I didn't like it till I got older, my dad loves it so I make it for him often. I agree needs spice. Hope you are having a great week. >I just ate some gingerbread this morning at my daughter's sitters house and decided to find a stellar gingerbread recipe to bake this weekend. I guess I can check that one off my list! Thanks for a great recipe! >The cake does look delicious. I could eat a piece just like it is- a "purist piece". Sometimes those are the best. Glad you decided to do the video in your posts, sometimes showing is better than the written word. I look forward to your next post, but in the meantime I will enjoy the video. Have a great day! >I love gingerbread, it's one of my favorite holiday treats. >Looks so yummy! Always loved gingerbread! >Ooooo, I love gingerbread. The strong flavor is what always appealed to me to be honest. It's not a wimpy boring cake by any means lol. I love the looks of your version and will have to give it a try! >My husband and I love gingerbread! Awesome video. >I used to buy gingerbread with my pocket money and climb into my treehouse and scoff the lot – greedy little monster that I was. This looks like a cake that I would share only reluctantly. Yum! >I so love gingerbread, especially this time of year. Puts me in the mood for the holidays. Thanks for sharing your recipe, I will have to give it a try…for some reason, I always make gingersnaps or gingerbread cookies rather than the bread itself. Sounds yummy though! >The perfect treat for the holidays, I'm loving it! And the video is fantastic 🙂 Thank you for sharing! >The gingerbread looks delicious! Great twist with the molasses! >Oh, my gosh, your gingerbread looks so moist and delicious! I really want to dig into one of your slices…with a dollop of whipped cream. Fabulous! >This looks amazing! I love gingerbread. I'm allergic to cinnamon, but I think you have enough other flavors that it would work! >Great tip about the molasses. 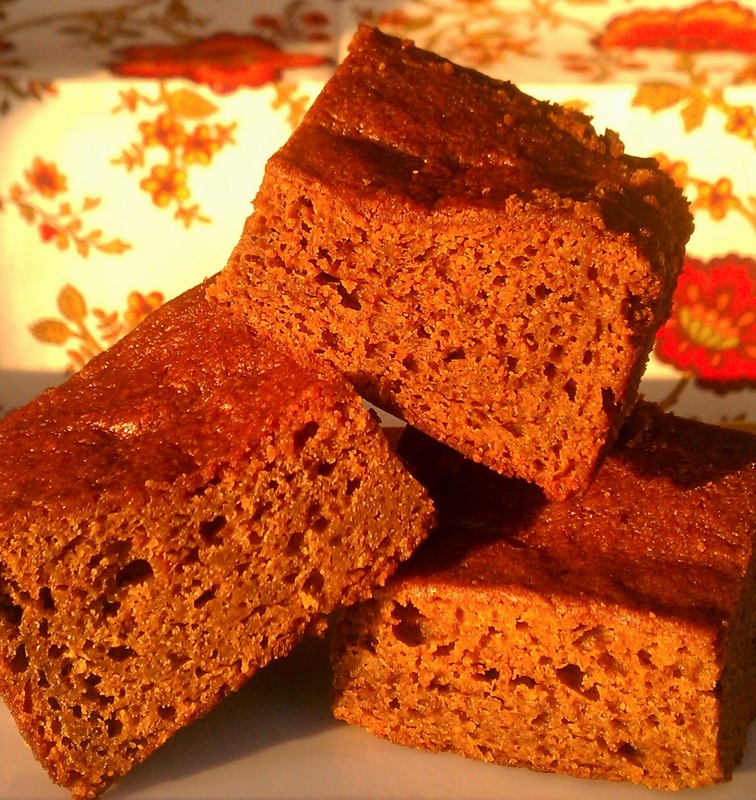 I've discovered a recent love of gingerbread too, so I appreciate seeing your recipe! >That looks and sounds wonderful – is there anything I can substitute for the molasses though (I don't think I can quite get that in the UK yet)? >I like the more mild molasses, but I love all of the spices, especially cinnamon. I can't wait to try this yummy cake. Gingerbread is my new pumpkin for November. >Yum, this looks so good!!!! I haven't had Gingerbread in years!! >This sounds delicious! Although I bake quite a bit I still have to make gingerbread someday, you are inspiring me to do so :)! >Thanks for all your kind words on the gingerbread and the video! @Galit – You can substitute 3/4 cup maple syrup for the molasses. If you don't have that you could also use honey or dark corn syrup. I would go with the maple syrup. Let me know how it turns out! >I used to love gingerbread but I have a very sad sad allergy to ginger that has gotten worse with age L I think I’ll just live vicariously through your gorgeous pictures!! >This is fabulous. I love gingerbread. This is a lovely recipe and I think I'll be trying this out over the holidays. Nothing like the taste and smell of gingerbread. >This is great work….love the video…. >Gorgeous color on the gingerbread. Congratulations on the Top 9! >congrats on the Top 9 today! >I love gingerbread. It brings back wonderful childhood memories. When I was a child my mom would take my brother sister and I to a place in Oregon called the Gingerbread House. It was always warm and spicy with sweet whipped cream melting over it. >I love gingerbread, but I didn't know that different kinds of molassas could change the flavor that much. Great post! >I can't wait to try this! Love the video! >Sweet & sassy? My kind of gingerbread!